Elegant pillow with scallop shell featured in oval frame with floral border. Beautiful colors and matching pillows to add to your collection. Shop from the scallop shell, conch shell, seahorse and sea turtle pillows (sold separately). 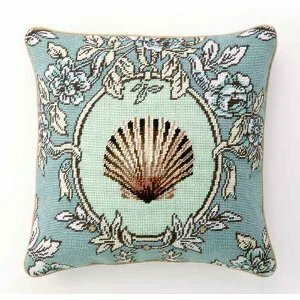 Decorative pillows for your coastal decor. Designed by Suzanne Nicoll. Measures: 16" x 16" Decorative pillow has a zippered area on back side to replace pillow insert. This pillow comes with a pillow insert.